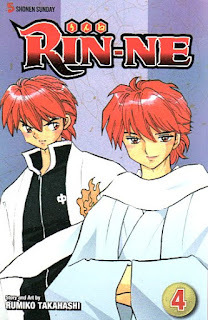 We learn more about Rinne - and his terribly dysfunctional family - in Rin-Ne Volume 4. Note: Rin-Ne Volume 4 is, of course, the sequel to Rin-Ne Volume 3. The review of Rin-Ne Volume 1 is here, and the review of Rin-Ne Volume 3 is here. Otherwise, read on! Poor Rinne. Not only has he caught an 'afterlife-strain flu', he doesn't even have the funds for a box of tissues! And when a doctor and nurse come to visit him, sent by a relative, that's pretty strange, too. Turns out, Rinne's father is more than a deadbeat. Not only does he drain Rinne's bank account, not only does he take out loans in Rinne's name, he also runs the evil Damashigami Company. As we saw in Volume 3, a damashigami is a shinigami who has no qualms luring the not-dead-yet into the underworld to make their quotas and cash in on their spirits. Not only does Rinne's father run such an evil company, but he wants Rinne to agree to be the Young President and inherit the company from his father. And being evil and all, he will do whatever it takes to get Rinne to agree. But even with all the familiar disarray, there's still time to help out back at school. When a lucky mechanical pencil starts making the rounds, and students who ace a test with it start disappearing, something's certainly awry. And in the process of solving the new damashigami mystery, we meet Ahega, a shinigami searching for her long-lost sister. The longer 'Damashigami Company' story arc is a nice change of pace from the episodic nature of previous chapters. Also, the rate at which we are introduced to new characters has slowed a bit, which is nice. It'll be interesting to get to know the characters we have better as time goes on, as well as hopefully get more longer stories. Highs: Some more of Rinne's backstory makes sense, especially with a no-good father stealing what little money he gets. Lows: How clueless are we supposed to accept Sakura to be, when it comes to romantic interests? Verdict: More of what we've been seeing, which isn't a bad thing at all.